Heads up, DJI Spark owners: you need to install the latest firmware update when DJI releases it this week, or your flying machine will be grounded come September 1. The good news is that the update brings a batch of improvements to the portable drone, including enhanced safety features. The improvements include a boost to the battery management system for optimal power usage while in flight, support for full integration with the DJI Goggles and, when using the hand-gesture controlled PalmLaunch function, increased stability after takeoff. There's also improved control accuracy when in QuickShot Dronie mode and a compatibility upgrade for the remote controller when it syncs with new firmware updates (go figure). The slightly less palatable news is that should Spark owners fail to update the firmware on either their drone or the battery by the first of next month, their drone won't be cleared for takeoff. In other words, it's not flying anywhere. 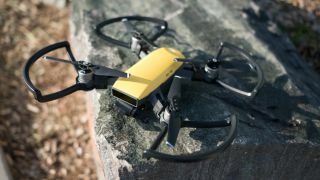 DJI said in a blog post it decided to keep Spark drones that don't get the mandatory update from launching to "maximize flight safety and product reliability which we consider top priorities." You'll get an alert when the firmware is ready through the DJI GO 4 app, but note you'll need an internet connection to install the firmware to the drone and battery. Another option is to install the firmware through DJI Assistant 2, the company's desktop software.